The 1970s were a time of major change for Bismarck. The decade would see the most development Bismarck had seen up to that point – a triumph not again seen until the 2000s. From housing to retail, Bismarck’s landscape would be forever changed. Although the interstate greatly contributed to the demise of Bismarck’s downtown, nothing would affect it more than Kirkwood Mall. A decade-long dream of Paul Wachter, construction began in 1970, and it was the biggest single development in the city up to that point. Shortly before the official opening of Kirkwood, Dan’s Supervalu opened its second location adjacent to the center. Following the opening of Kirkwood, the area around the mall quickly became the main economic hub of the region. 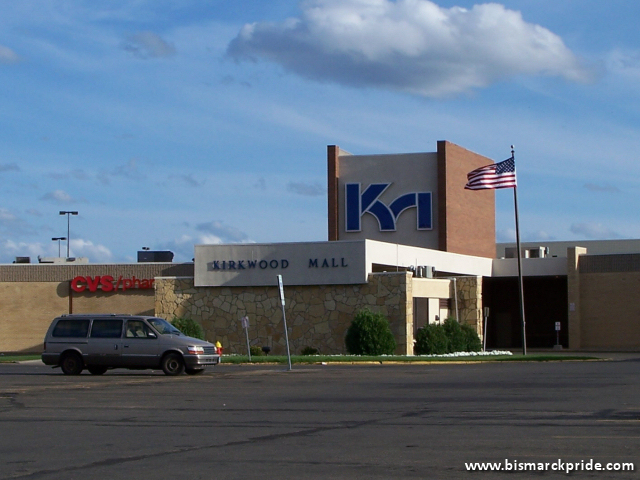 Kirkwood Mall was named after former F.W. Woolworth CEO Robert Kirkwood, who had once served as store manager for the Bismarck Woolworth. Kirkwood greatly added to the demise of downtown Bismarck. Area shopping was drastically modernized by Kirkwood Mall, so it was inevitable that discount department stores would soon follow. Kirkwood opened in April 1971, with a Grand Opening celebration held the following month, featuring special guest Robert Kirkwood. The new shopping center offered a great advantage in that it had plenty of parking and that shoppers could move freely from one store to the next without walking the streets of downtown Bismarck. Even following the opening of Kirkwood, several retailers, including Sears, A.W. Lucas, and J.C. Penney remained located in the downtown area for the next few years. Kirkwood Mall proved to be a success. Shoppers enjoyed the convenience of the enclosed mall, even though it was a further drive to most living in the city. Other businesses sprouted liked weeds near the new mall, including, what was then, the city’s largest hotel. Kmart opened in October 1971. Another major retail development at the time was the city’s first modern-day discount department store, Kmart, which opened its doors in October that same year. 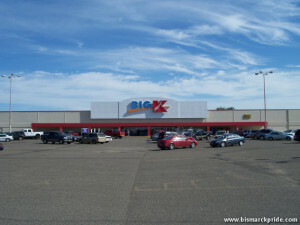 Kmart was one of the first major businesses to open north of Interstate 94, and became the initial catalyst for development along the State Street Corridor. Up until the 1970s, Bismarck’s downtown was hustling with activity. Local businesses and national chains competed successfully as they lined the streets of downtown. U.S. Highway 10 ran through the heart of downtown Bismarck along Main Avenue, connecting with the only vehicular bridge in the region to cross the Missouri River. Prior to the automobile, the Northern Pacific Railroad brought visitors directly into downtown. The Parkade opened in 1970. As the city grew, and families began to purchase automobiles, downtown Bismarck began to see major traffic and parking problems. 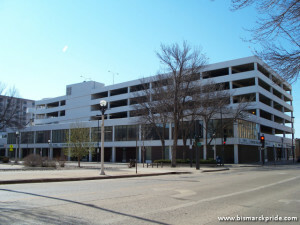 To help alleviate parking problems, a parking ramp was constructed in 1970, but this only slightly resolved the issues. In 1972, the Urban Area Transportation Study recommended a transportation plan to upgrade and convert 7th and 9th Streets into a pair of one-ways. The underpass at 7th Street was later added to the project. 7th Street was to be widened between Boulevard and Rosser Avenue, and and 9th Street rebuilt from Bismarck Expressway (then Bismarck Avenue) to Michigan Avenue. New traffic signals were also installed on 9th Street at Rosser, Broadway, Main, and Front Avenues; and, on 7th at Bismarck Expressway, Front, main, Broadway, Rosser, C, and Boulevard Avenues. The Bismarck City Commission conditionally approved the recommendation in 1973, opening it to a public hearing. The project met with hot debate. About 200 people attended a public hearing regarding the proposal on August 22, 1973, mostly in protest. The project was green-lit in 1975, commenced in 1976, and concluded in September 1978. The street alterations were an answer to increased congestion for north-south vehicles, due largely to the city’s north-south growth as opposed to east-west growth. In particular, the sudden explosion of development south of the railroad, ignited by Kirkwood Plaza and Bismarck Civic Center, necessitated an additional railroad bypass. Funding for the conversion mostly came from the Federal government; all but $110,000 of the $2.2 million, including the entire underpass construction. Coincidentally, Bismarck also approved a set of new downtown one-ways as part of its Chancellor Square project in 1974. Eastbound roads Broadway Avenue and Thayer Avenue were converted, in addition to northbound roads Fourth and Fifth streets. These one-ways were restored to two-ways in 2017. Bismarck’s downtown also contained some of the oldest buildings in Bismarck, and many were becoming extremely outdated and incapable of meeting the needs of the city. Kirkwood Motor Inn opened in 1974, offering the first true competition to the highly successful Holiday Inn, located on Memorial Highway. Not only did Kirkwood Motor Inn feature a larger banquet hall than did Holiday Inn, its location – directly across from the region’s largest shopping center – was prime real estate. Downtown hotels could no longer compete against the modern facilities popping up across the city, resulting in the closure and subsequent demolition of the Grand Pacific Hotel in 1974. The Patterson Hotel closed a couple years later, followed not long after by the Prince Hotel (then known as the Kensington Hotel). 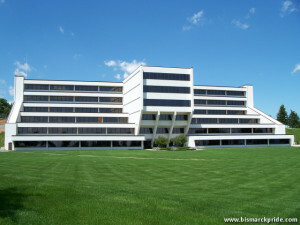 Basin Electric completed its new headquarters in 1974. 1974 saw the completion of Basin Electric’s new headquarters and the opening of Bobcat Manufacturing Plant, both of which became amongst the region’s largest employers for decades. The area where U.S. Highway 83 bisected Interstate 94, near the newly completed “Kmart Shopping Center” – as it was called at the time – was also becoming prime real estate for development. During 1975-1976 alone, four new hotels would open near the interchange. Numerous gas stations and restaurants were also quickly becoming established near the interchange, including a Village Inn and Country Kitchen. By the 1970s, it was becoming increasingly clear that the high school building was no longer adequate to serve Bismarck. The city was faced with the choice of either expanding the current building, or constructing a second high school. They ultimately chose to construct a brand-new high school, to be located in booming north Bismarck. Century High School opened in 1975 to supplement Bismarck High School. The school took its name from the fact that it was approved in 1972… Bismarck’s centennial year. Coincidentally, its completion also coincided with the nation’s upcoming bicentennial the following year, leading to the school adopting its mascot as the Patriot with its official patriotic colors of red, white, and blue. The school was named in recognition of the nation’s bicentennial, and adopted the Patriot as its mascot and patriotic school colors. Anticipating future growth, the new high school was built on, what was then, the northern edge of Bismarck. At the time of its opening, Century High School seemed to be on the edge of humanity, but the region was quickly becoming a major business center. The Wells Fargo Building was completed in 1976. 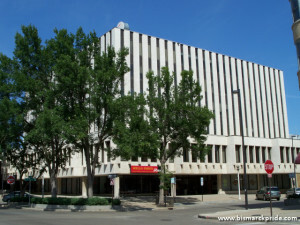 Norwest Bank (now Wells Fargo) completed construction of a new Bismarck regional office in 1976 on the site that had held the Grand Pacific Hotel, and its predecessor, for over ninety years. A large winter fire destroyed or severely damaged most of an entire city block in 1977, on Main Avenue between 3rd and 4th Streets. Several historic buildings were destroyed in the fire. 1st National Bank (now U.S. Bank) completed construction of a new regional office building at the corner of 3rd Street and Broadway Avenue in 1978. 1979 saw several major road projects. State Street was reconfigured into six lanes to Century Avenue. The interchange west of the Memorial Bridge was also added, connecting The Strip with I-94. Gateway Mall opened in 1979. 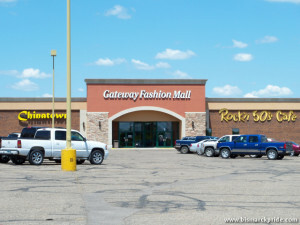 Gateway Mall opened in September 1979 directly across from Century High School and Kmart, at the intersection of State Street and Century Avenue. Anchored by Sears, A.W. Lucas, and White Mart, Gateway Mall was the city’s third fully enclosed shopping center. Like Kirkwood, Gateway opened with great anticipation, and helped establish a new major business hub, all while contributing to the decline of downtown. National catalogue retailer LaBelle’s, later Best Products, opened a Bismarck showroom in 1979. Regional grocery chain Cash Wise Foods opened next door on June 30, 1982. Kirkwood Mall completed construction of a new south wing in 1980, with the addition of two new anchors, Target and J.C. Penney, forever ending downtown’s presence as a major retail hub.